T.R. WHITE SON & Co have over 50 years experience in the gunmaking tradition and are on hand to offer advice whatever your needs may be. Tony was fortunate to be involved with all stages of gun making during his gunmaking apprenticeship, ​gaining experience in both metal and wooden components as opposed to focusing on either actions or barrels, specialising in stocking in latter days. Renowned for his attention to detail and balance of creating a gun fit for its purpose in the field, as well as being aesthetically stunning. tony is one of the few gun makers in Britain who colour case harden. Still very involved with the trade, tony attends regular meetings as a guardian of Birmingham Proof House along with previously being the president of the gun makers association. 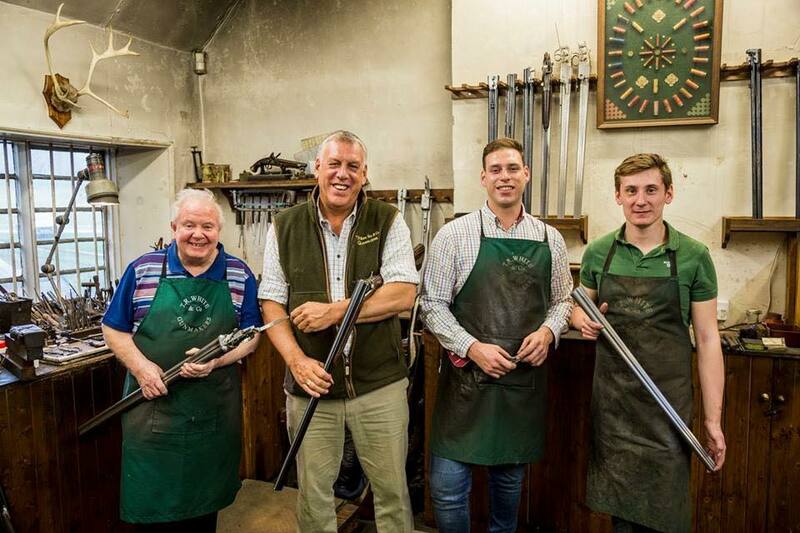 Tony can be found shooting his own bespoke 12 bore over and under T R White Son & Co shotgun. Matt followed in his fathers footsteps and headed to London on leaving school, where he completed an apprenticeship at Holland & Holland, Securing a full time position for 8 years before returning to his roots at T.R White & Co in 2014. Matt ​Specialised in finishing, after spending part of his apprenticeship in the repairs department before the Finishing shop, further developing his knowledge and skills in areas such as chequering, oil finishing and regulating. Such experience has provided Matt with a firm understanding and passion for restoring the finest guns. ​A keen shot, Matt is proud to shoot with a T R White & Co side by side bespoke shotgun built by Tony & Ted in 1995. Ted was formally Tony's mentor and colleague during their days at W & C Scott. Ted specialised in jointing, internal work, ejector work, single triggers and design during his time at Webley & Scott, W & C Scott, Westley Richards and the Holland & Holland group. Before joining forces full time with Tony, completing their first 'T.R White & Co bespoke shotgun together in 1991. Over twenty years and over 100 bespoke shotguns later Ted is now based with the team here in the workshop.